Stepping on to the plane at Heathrow one Friday evening after battling the drive down the M4 at rush-hour was where the excitement and anticipation hit me. Italy does this to me every time I visit and sitting down at my seat I was fidgety with eagerness to land already. Rome, the Eternal City, was our destination of choice on this long-weekend visit. A living, breathing city steeped in history with a dynamic social and culinary scene complete with street food stands selling everything from pizza to gelato to cannoli. This trip was in partnership with The Post Office who provided me with the opportunity to use one of their Travel Money Cards with the aim of working out exactly how much it costs to eat and drink when in Rome, and to help with their very insightful 2018 City Costs Barometer report. I usually change all my cash over before I travel and have my credit card handy for anything else that I may need, so this way of spending was new to me. Downloading the app and activating my card was the first step and I found it to be surprisingly simple and very much like a normal banking app. It also has the added extra of finding the nearest cash machine to wherever you are. Conveniently provided with the contactless feature and my own PIN the process of using the card was effortless. All shops, cafes and restaurants accepted it and I’ve got mine stashed in my purse ready for my next holiday. Using the Travel Money Card wasn’t my only first for this trip as I also booked our accommodation through Air BnB. We were a two minute stroll away from the Trevi Fountain and our apartment (this one if you fancy a nosy) was modern, clean and very funky! Glass floors, a TV that glided up and down between lounge and bedroom and a kitchen that just begged for me to get a pan of pasta on the hob as soon as realistically possible. So many people go to Rome and head immediately to the beautiful Colosseum, the Roman ruins and of course, the mesmerising incredible Trevi Fountain, and we were no exception to this either. Our mouths were watering, and our taste buds were ready to go! Now I know there’s a bit of a thing about avoiding tourist trap restaurants for fear of the food being shocking and the prices even more so, but there are exceptions to that rule. For me it’s the views, and having my breakfast outside the Pantheon one sunny, fresh morning is something everyone should experience. A front row seat to the chaos and chatter between locals and tourists is something that satisfies my natural nosiness, it’s people watching at its best. And guess what? My spinach and cheese omelette washed down with a freshly squeeze Blood Orange juice and a Café Latte was blooming delicious, and in my opinion, reasonably priced for where I was sitting. I find Rome changes my whole mood, my thoughts and whilst slightly cheesy, I find it incredibly inspiring too. I daydream when wandering down the back streets, I make plans in my head that I’d never have thought of before and I feel revived. No trip to Italy would be complete without copious quantities of pizza, and Rome seemed as good a place to indulge as any. As with most famous cities: Barcelona, Paris, Vienna, even London, prices in Rome can vary hugely. One coffee shop may charge €6 for a latte, while if you take a few steps off down a cobbled side street I can guarantee you’ll find one for €3. If you’re lucky they’ll be a sneaky little biscotti on the side too. It’s about making the right choices and exploring to find the right prices. Be careful, do a little research and strive for authenticity. You can’t truly relax and enjoy your well-deserved getaway until you’re sitting back with a glass of Aperol in one hand and a menu in the other right? Rome is paradise for carb lovers, so the first thing that comes to mind about Roman cuisine is probably its delicious pasta. So that evening we headed to Colline Emiliane which had been recommended by our Air BnB host and I ate Gnocchi with cheese, a side order of garlic Spinach and yes, I got my Aperol Spritz all for a total cost of €28. There is nothing like a hearty pasta dish to warm you from the inside out. Something I’ve been dying to book for some time is a food tour and Rome gives the ideal opportunity for this. I booked through Withlocals and with an arranged meeting point at Campo de Fiori we began our three hour adventure. Me giddy with excitement, our host Yanira, who has an infectious passion for Rome, had no idea what she’d let herself in for. (If you fancy an idea of a tour like this then this link will give you €30 off a booking). There’s only so much you can learn about a city from reading books, looking online or tourists guides and signs at famous sights. Having a private tour with a local person teaches you all the cities secrets, tales and hidden gems. The best thing about doing a foodie tour is that it provides context to the foods you are enjoying and the city you’re exploring. We wandered through markets laughing at the stall holders shouting at us to come to them, Yanira all the time giving them that warning but friendly look to stay away. She joked, was always polite and had a way of getting exactly what she wanted every time. It was fascinating to watch. Her English, especially her accent, was impeccable and the ease of switching between languages was impressive. Italian people are dramatic but happy, calm but intense, all seemingly impossible and with passion and truth. People are positive, and you can feel it, all around. For such a big city, Rome is conservative in terms of food. Ethnic restaurants are few and far between. Sushi is rare, and locals tend to be, in general, wary of new food trends. We chatted about this with Yanira who looked at us questionably when we mentioned that we loved Indian food…we quickly moved on. Visited a family patisserie called Nonna Vincenza where you can enjoy the best Cannoli in the whole of Rome! We snacked on simple fresh warm focaccia with a homemade tomato and basil sauce drizzled on top at a steal for €1.50 a slice. Walking to our next stop munching away on our snack we learnt about the different regions of Italy and where each specific food comes from. Pizza is from Naples, Balsamic from Modena (and only Modena) and the giant juicy peppers and lemons we kept spotting were from Sicily. Hidden in the heart of the city, found a stone’s throw from Piazza Venezia and Capitoline Hill, we ended up walking through The Jewish quarter. 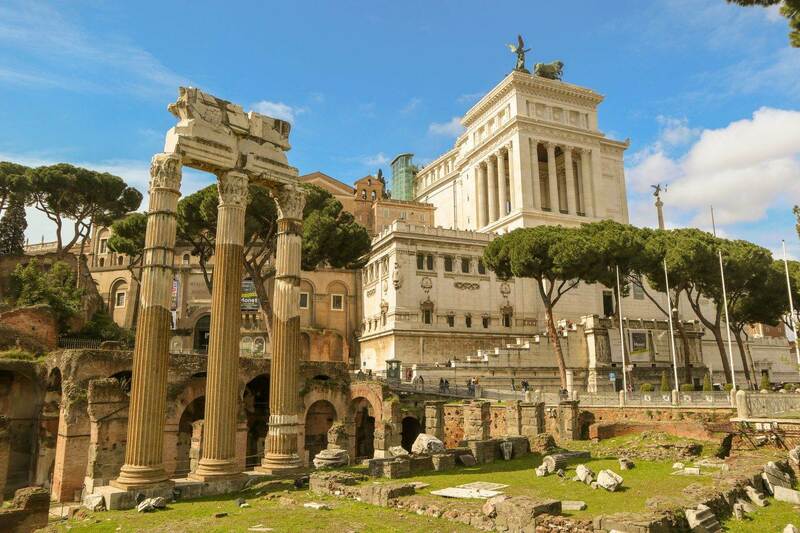 As the oldest Jewish community in all of Europe, this beautiful, thriving neighbourhood is as central to the history of Rome as it is to the Jewish faith. Walking through the barriers of where the ‘ghetto’ once began we spotted lots of signs about what this city went through in the Second World War. The Jewish influence can be felt with a high concentration of Kosher restaurants and of course a large Synagogue, the largest in Rome, whose square dome proudly stands out in the roofscape. My favourite stop here, and to be expected, was the 300-year-old Boccione. Famous for their crostata, a perfectly baked double-crusted, over-stuffed ricotta and wild cherry pie, I was in heaven. I wanted to stash it in my bag and devour guiltily when back in our apartment but Yanira encouraged me to not worry about the mess, get it on my face if I needed to, so be it! I did. At €4 a slice (€18 for a whole pie), it’s easily worth it. I nearly went back for more knowing I’d never be able to recreate this myself or get it again when back home in the (UK). Boccione is so popular it neither has nor needs any signage outside (or a website to link to!) Find it by following the smell of freshly baked cakes that spreads all over the ghetto or look for the crowds waiting for their daily sugar fix. Just make sure you head there by lunchtime before everything sells out. Not such a secret place we next stopped off for coffee at Sant’ Eustachio Il Caffè where locals and tourists all mingle, shout orders and sip their €4.30 espressos together at the counter. Italian coffee is one of life’s great pleasures. There is nothing better than sidling up to an Italian bar to order a cappuccino. Made with a secret technique and steeped in history with its founding all the way back to 1938 this place has the liveliest of atmospheres. But after you’ve enjoyed your coffee you need to move on. Unless you get lucky and nab a table outside it’s a pit stop. €5.50 each, more depending if you want to stuff it with extra deliciousness. Suppli means surprise and you will find them on most menus in Rome. Originally a street food snack sold at corner-side stalls, these fried risotto balls are so named because they contain a surprise inside. Sticky, soft and deep fried they are filled with a homemade tomato sauce and the surprise is the melting mozzarella middle. My favourite! A weekend in Rome was nowhere near long enough to explore this incredible foodie city. You could spend a lifetime eating your way through its classic restaurants. The city is blessed with a remarkable number of delicious food options and it’d be impossible to eat at them all, even if it would be a lot of fun trying! For those of you who have never been, go. For those of you who have been, go again. And when you do, make sure you pretend you’re Audrey Hepburn in Roman Holiday and toss a Euro in the Trevi fountain!